Long ago in Ireland, in the time of the Fianna, one of the greatest and most famous warriors under Finn mac Cumhaill’s leadership was named Diarmuid O’Duibhne. Diarmuid was the son of a man named Donn, and he was raised with his half-brother, the son of a man named Roc. One day, the son of Roc was frightened by an animal, and he ran between the legs of Diarmuid’s father Donn to hide. Donn squeezed the child between his thighs until he died. When the child’s father, Roc, found his son’s broken body, he wept and raged. Then he performed a magical ceremony, and brought his son back to life in the body of a wild boar. He put a geasa on it to kill Donn’s son Diarmuid, and sent the boar off into the wilds, because he knew that Diarmuid had a geasa on him never to pierce the skin of a pig, and would not be able to defend himself. Besides the wild boar’s enmity, Diarmuid grew up to be a great warrior, and passed the rigorous tests to become one of the Fianna. The love and loyalty he had for Finn Mac Cumhaill was very strong, but Diarmuid was known for more than his fighting skills. He was a great favourite among women, being very beautiful, and he was born with the Bol Sherca in the middle of his forehead. This was a magical spot that made anyone who saw it fall in love with him. Diarmuid knew that this could cause all sorts of trouble, so he grew his hair down over his forehead to cover it, and tried to keep it out of sight. Finn loved all the finest things in life; feasting, storytelling, hunting and good company; and he decided that he had been too long without a wife. So he called his men together and asked for their advice on the matter. They all agreed that the only woman in Ireland fit to be the wife of the great Finn Mac Cumhaill was the daughter of the High King Cormac Mac Airt, called Gráinne. Now, Finn was aware that he was a good deal older than Gráinne, and he was shy of asking for her hand himself, so he sent two ambassadors to speak to Gráinne on his behalf. 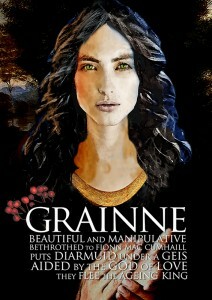 Gráinne was the most beautiful woman in Ireland at that time. When she was twelve years old, she had seen a boy playing hurling, and the wind had blown his hair back from his face, and she had fallen in love with him, completely and irrevocably. And as the years passed, she had refused every man who had ever asked for her hand, for love of the boy on the hurling field. But when she heard that the great Finn Mac Cumhaill was asking for her hand, she was flattered. She decided that she had spent long enough waiting for this boy, and she did not know his name or where to find him, so she might as well marry Finn. When her answer was given, a great feast was held to celebrate the upcoming wedding. Gráinne hid behind a curtain, to spy out and catch a glimpse of her husband-to-be. She Finn’s son Oisin sitting beside him, and was struck by the contrast between them: how much younger and more beautiful Oisin looked than his father. She wondered why Finn had asked for her for himself, and not for his son, and she began to regret her decision. And then Finn moved out of the way, and she saw the man seated on the other side of him: Diarmuid O’Duibhne. The boy from the hurling field who she had loved since she was twelve. At that moment, Gráinne resolved that she was not going to marry Finn Mac Cumhaill. She sat down to the feast, saying nothing, and passed around a cup of wine, into which she’d put a sleeping posset. She gave it to Finn, and to all of the Fianna, apart from the leaders of the Fianna. Then, one by one, she asked each of the leaders of the Fianna if they would run away with her. They all refused, such was their loyalty to Finn. Then Gráinne turned to Diarmuid and put him under a geasa to run away with her. Very unhappily, Diarmuid went away with Gráinne. Unused to hard travelling, Gráinne grew weary after a while and asked Diarmuid to carry her, but he refused, hoping she would give up and go back to Finn. Instead, she put him under a geasa to go and find horses for them, and he had no choice but to do as she asked. They met with Aengus Óg, the god of love, who thoroughly approved of their match, and decided to help them. He told them that they were never going to be able to sleep in a cave with one opening, or a house with one door, or a tree with one branch, and that they would never be able to eat where they cooked, or sleep where they ate. They would have to keep moving if they were to stay ahead of Finn and the Fianna. When Finn Mac Cumhaill awoke the next day from the sleeping potion, and realized what had happened, his heart broke. 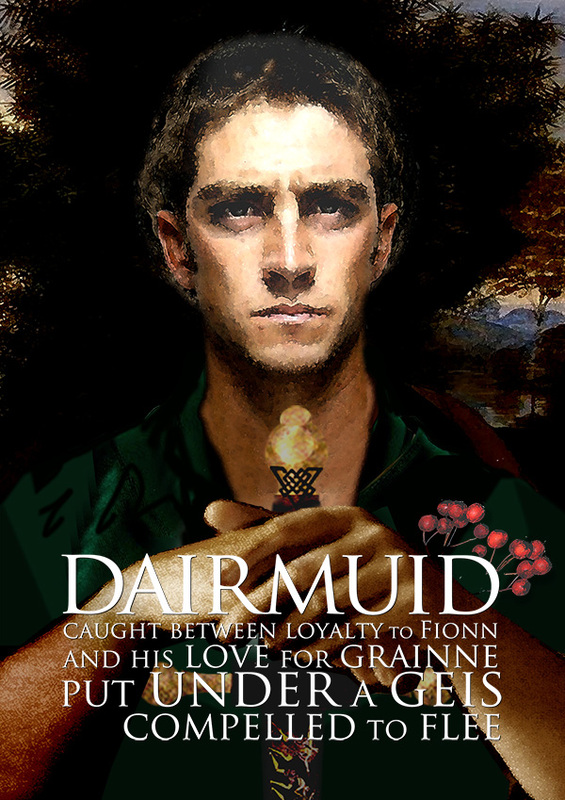 It was not Gráinne’s desertion that hurt him, but the fact that Diarmuid had betrayed him. He set out with a grimness and a set in his jaw to catch them up and get his revenge. For a long time he chased them, and they were always one step ahead. Every time he came across their traces, he grew more and more furious, but every time he found one of the nests that Diarmuid had made for Gráinne, he found that Diarmuid had left a piece of raw meat or fish as a message to Finn that he had not touched Gráinne. Then one day, as Diarmuid and Gráinne were crossing a ford, a splash of water wet her thigh. She said to Diarmuid that whatever courage he might have in battle, that splash of water had more courage than he. And Diarmuid was shamed into making her his wife, and after that he left no messages of purity for Finn. One night, they slept in a house with seven doors, and Finn and the Fianna caught up with them. A member of the Fianna stood at each door to make sure they couldn’t escape. Aengus Óg came down, and told them that he would spirit them away to safety, but Diarmuid refused. He sent Gráinne away with the god, and stayed behind. Diarmuid went to each door in turn, and at each door, the man who guarded it offered to let him go, till he came to the seventh door, guarded by Finn Mac Cumhaill. Roaring in anger, Finn told him he would kill him if he came out that door. Diarmuid opened the door to face him, and took to the fight. When the Fianna surrounded him, he leaped up with the leap of a salmon, jumped over their heads, and ran away to join Gráinne. Later that year, Diarmuid got permission from a giant to hunt on his land, provided he did not eat any of the magical rowan berries that grew on the tree where the giant lived. But Gráinne, who was pregnant, longed for the berries, and so Diarmuid killed the giant for her. The berries high up in the tree were sweeter than those below, so the two climbed up into the tree to the giant’s bed, and ate berries and rested a while. The Mac Morna clan, enemies of Finn Mac Cumhaill, came to make peace with him. Finn said that he would agree to a truce if they brought him either the head of Diarmuid O’Duibhne, or the magical berries of the rowan tree. They decided the berries would be easier to get, so they set out, but of course, they found the giant slain and many of the berries missing. Finn knew that only Diarmuid could have killed that giant, since it wasn’t one of his men, and he and the Fianna spent that night camping under the tree. Finn had a good idea that Diarmuid was still up there. He challenged Oisin to a game of chess, and as Oisin began to make a move that would lead to Finn beating him, a berry dropped onto the square that he should move to. He made the move, and continued to follow the guidance of the rowan berries. Eventually, Oisin beat his father at chess for the very first time. Finn Mac Cumhaill sprang up, saying “There’s only one man in Ireland who could have beaten me at chess, and that’s Diarmuid O’Duibhne.” And there was Diarmuid, looking down on them from up in the tree. Diarmuid leaped to safety, while Aengus Óg spirited Gráinne away. After years and years on the run, and all the time Diarmuid and Gráinne had spent living together as man and wife, raising their four sons and their daughter, and never able to stop or rest, they decided to try and make peace with Finn Mac Cumhaill. Finn agreed to put his anger aside, and welcomed them back with a great feast. They were finally able to settle down with their family and live in peace, and Diarmuid and Finn rebuilt their great friendship. Finn saw the beast charging at him, and reminded Diarmuid of his geasa, to never pierce the skin of a pig. The boar gored Diarmuid, and Diarmuid hit it on the head with the hilt of his sword, killing it. But it was too late, and Diarmuid lay dying. He asked Finn Mac Cumhaill to give him a drink of water from his hands. Anyone who drank water from the hands of Finn Mac Cumhaill would be restored to health, because of his magical thumb. So Finn went to the river, and carried water back to Diarmuid, but at the last moment, he remembered with bitterness, how Diarmuid had run away with Gráinne, and he let the water trickle out between his fingers. But he saw Diarmuid didn’t have long, and the great friendship between them moved his heart, so he went back for water, only to let it trickle through his fingers a second time. The third time he went back for water, and there was no bitterness left in him. He poured the water in between Diarmuid’s lips, but it was too late. Diarmuid O’Duibhne was already dead.